AN ambitious, predominantly Central Coast based four car super team is set to hit the track this weekend at Victoria’s Winton Motor Raceway, making its debut in the inaugural Toyota 86 Pro Am Racing Series. Toyota dealer Brian Hilton Motor Group has thrown its weight behind the squad which features young Central Coast drivers Luke King, Drew Ridge and Josh Hunter as well as Sydney’s Gerard Maggs. 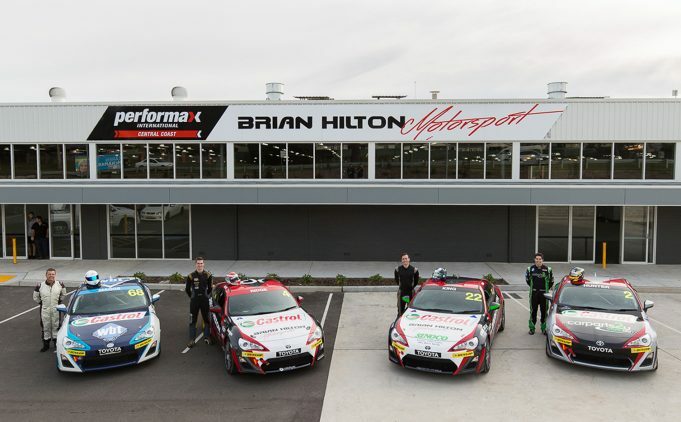 Based at Lisarow on the Central Coast, the cars are being prepared at the new Brian Hilton Motorsport operation which is located in a re-purposed warehouse, affectionately described by the team as the ultimate ‘Man Cave’. Along with the launch of the team has come news of a secret weapon ahead of the opening round at Winton, with successful former V8 Supercar and Carrera Cup team manager Paul Cruickshank joining the operation, bringing vast experience as team manager for the fledgling four car Toyota team. Cruickshank has worked with leading teams including DJR, Stone Brothers and his own V8 Supercar and Carrera Cup teams in the past. Luke King and Drew Ridge will be behind the wheel of the two Brian Hilton Toyota backed cars, Josh Hunter will run under Castrol backing while Gerard Maggs’ machine will feature WBT/Samsung livery. At 17, Drew Ridge is the youngster in the team with the Year 12 Terrigal High student having six years experience in karts, including winning the Australian Junior Clubman title in 2014. Ridge has also competed in the Asia Cup Formula BMW series at Sepang in Malaysia as well as competing in selected rounds of the Australian Formula 4 in 2015, taking a podium in his first round. 20-year-old Josh Hunter comes to the Brian Hilton Motorsport team with a fine pedigree. As well as being the grandson of legendary 10 time Australian Sprint Car Champion Garry Rush, Hunter started racing in karts at age nine, won the 2012 V8 Touring Car Series as a rookie and has raced in the V8 Development series. Luke King is a 25-year-old Central Coast racer who joins the team with the 2014 Australian Manufacturers Endurance Championship to his name along with race wins in Formula Ford, a season as a test driver for leading V8 Ute team Hi Tec Motorsport and 13 years race experience, having started out in karts at the age of 12. Hailing from Sydney’s Hills District, Gerard Maggs is the managing director of major consumer electronics distributor World’s Best Technology and an enthusiastic amateur racer who has tackled the World Time Attack in the past and will take on the Toyota 86 Series as a rookie. Brian Hilton Motorsport Team Principal Josh Hilton says the four-car team is a great way to showcase the Group’s new motor sport facility, which is due to open to the public in the next couple of months. All of the team cars will enjoy support from Castrol, Milwaukee Tools, Dickies Clothing and Ikon Signs. The new Brian Hilton Motorsport operation is the brain child of Hilton who will oversee the new facility and is excited by the prospect of offering local enthusiasts a great destination, whether grabbing a coffee or a meal in the café, watching the race cars being prepped in the workshop or buying race apparel, merchandise or gear at the motor sport shop. In addition, the new Brian Hilton Motorsport facility will also host a Classic, Muscle and Performance car sales operation along with a Performax International dealership where buyers can purchase the best pick-ups America has to offer. Along with some rising driver talent the Brian Hilton Motorsport team has secured the services of highly experienced race engineers, Nigel Boling and Brad King along with head mechanic Jeff Davies, ensuring the on track talent is backed up by quality staff in the pit lane and paddock. The inaugural five race Toyota 86 Race Series kicks off at Winton this weekend before moving to Sydney Motor Sport Park in August, Melbourne’s Sandown in September, the famous Mt Panorama as a support for the Super Cheap Bathurst 1000 in October before the final round at the Homebush Olympic Park street circuit in November. Sponsored Post: This story was published on behalf of Brian Hilton Motor Group and Hilton Motorsport.